This painting about Simeon is one of the most important works of Dutch artist Arent de Gelder (1645-1727). He is reputed to be the last pupil of Rembrandt (1606-1669), which is clearly visible in his impasto style with thick layers of paint complemented with daubs and scratches. For his time, which had moved on to a preference of classical clarity and light colours, his Rembrandtesque way of working had become quite old-fashioned. But as he was a well-to-do man, he did not need to mind the prevailing trends. Just like Rembrandt he was a Calvinist. Even more than his master he limited himself almost totally to biblical subjects. They are works full of devotion, at once restrained and expressive. In the painting the four are portrayed close together in an intimate moment of prayer and praise. Simeon looks upwards, while he thanks God for the precious gift in his arms. His eyes roll somewhat away, as if he is already half on his way to heaven. Also the baby looks upwards. Mary and Joseph have their eyes closed, inwardly focusing on God. It is a holy gathering, filled with reverence and veneration. The painter, moreover, makes clear that also God is in their midst by means of the broad shaft of light that descends on them from the upper left. But the child, this beautifully painted child, is an even stronger source of light as he is the Light of the World, who has come to drive away the darkness. In this early Rembrandt – he was 21 when he painted this – also Anna has been added to the scene. She was 84 years old, the Bible tells us, having lived as a widow for most of her life. Day and night she stayed in the temple, where she served God in fasting and prayer. She just ‘happened’ to pass by and overheard Simeon’s canticle and what he said to Mary, namely that Mary’s soul will be pierced by a sword and that Jesus will be a scandalous sign to many, revealing their inner thoughts. 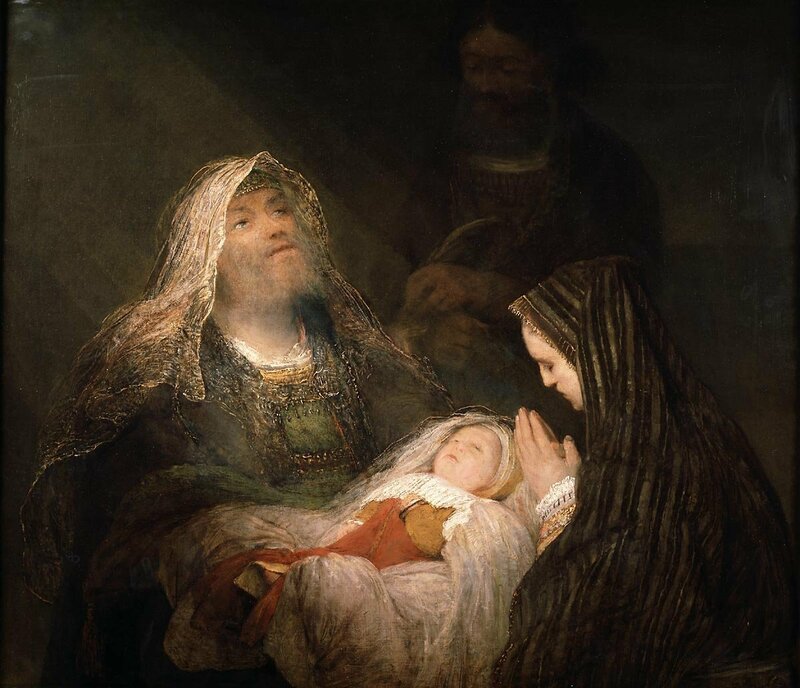 Rembrandt has portrayed Simeon, Joseph and Mary on their knees, kneeling for the Christ child. 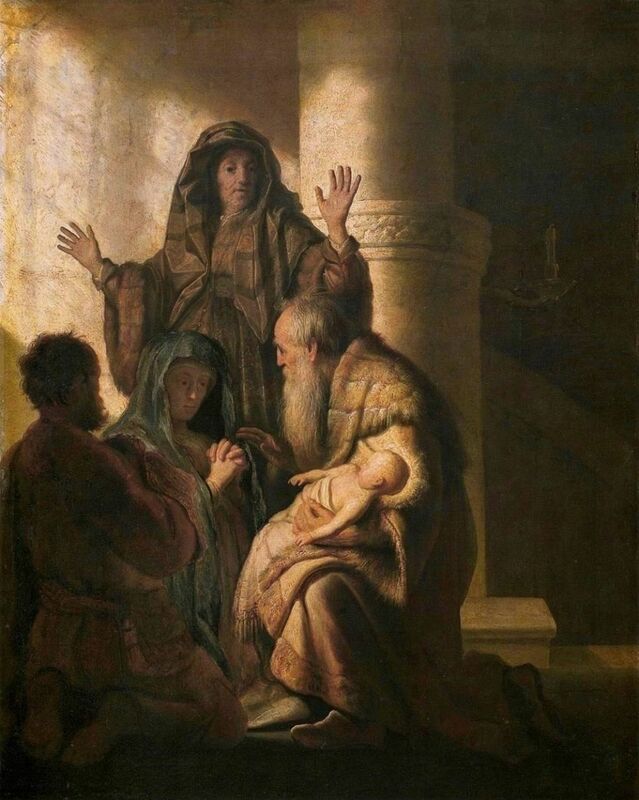 Simeon’s attention is fully focused on Mary, he bends towards her (the child almost sliding from his knee), grabs her hand, while he tells her that she has a life full of struggle and sadness ahead of her. Mary’s eyes almost fall from their sockets. With huge round eyes she gazes at the little Jesus. ‘The child’s father and mother were amazed at what was being said about him,’ the text tells us. Also Anna looks startled at the baby as she throws back her arms in thanksgiving. Simeon and Anna were one of Rembrandt’s favorite subjects. He depicted them time and again in different periods of his life and was also working on a painting of Simeon when he died. Apparently he was moved by these two ancient people, who lived so close to God and were able to recognize Jesus as the expected savior. About Simeon the text conveys that he was righteous and devout and looked forward to the coming of the Messiah. In the short passage about him the Holy Spirit is mentioned three times: he rests on him, guides him and reveals things to him. Also Anna has altogether dedicated her life to God. It has made them open and receptive to God’s acting. Even though they are old, they have their eyes wide open and are able to see what many cannot see. Two people who lived in hope and expectation and for this reason were given a role in salvation history. Arent de Gelder: Simeon’s Canticle, 1700, oil on canvas, 94,5 x 107,5 cm. Mauritshuis, The Hague, The Netherlands. Rembrandt van Rijn: The Prophecy of Simeon to Mary, 1627, oil on panel, 55 x 44 cm. Kunsthalle, Hamburg, Germany. Arent (Aert) de Gelder (1645-1727) was a Dutch painter, who spent most of his life in his place of birth, Dordrecht. De Gelder was a pupil of both Samuel van Hoogstraten and Rembrandt. Rembrandt's influence is noticeable in De Gelder's use of thick paint and chiaroscuro. Many of his drawings can hardly be distinguished from his great tutor. De Gelder however, preferred brighter colors. De Gelder came from a wealthy family and never had any financial worries. This enabled him to hold on to his own style, even when Rembrandt's style had already become unpopular. His 22-piece Passion series from 1715, now divided between the Amsterdam Rijksmuseum and Schloss Johannisburg in Aschaffenburg, Germany, is considered his most important work. Rembrandt van Rijn (1606-1669) was a Dutch painter and etcher. He is generally considered one of the greatest painters and printmakers in European art and the most important in Dutch history. His contributions to art came in a period of great wealth and cultural achievement that historians call the Dutch Golden Age. Having achieved youthful success as a portrait painter, Rembrandt's later years were marked by personal tragedy and financial hardships. Yet his etchings and paintings were popular throughout his lifetime, his reputation as an artist remained high, and for twenty years he taught many important Dutch painters. Rembrandt's greatest creative triumphs are exemplified especially in his portraits of his contemporaries, self-portraits and depictions of scenes from the Bible.